It is a bit of a stretch to draw an analogy between a sailboat’s wake and special relativity. A picture of a wake and the space-time diagram of relatively can be drawn to appear similar. This is an amusing coincidence, not a deep insight. 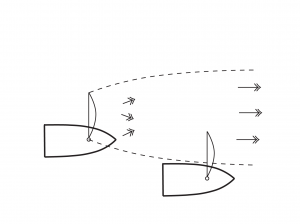 The boat on the left produces a wake with a fixed angle. This angle does not depend on the speed of the sailboat. Fast or slow, the wake angle is the same. Outside this angle, there are no wake waves. If one only watched the water, the boat would not be noticed outside the wake. The picture on the right shows that an event that happens at the point marked with the star cannot be observed until light from the event has time to get to an observer. Outside this “light cone” the event cannot be noticed. 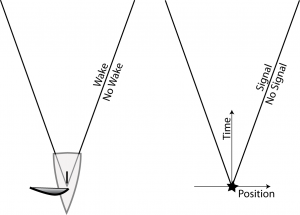 Just as the wake angle does not depend on the boat speed, the shape of the relativity diagram depends only on the speed of light. It does not depend on the speed of the object that produced the event, or the observer who detects it. Of course there are differences. Light travels a lot faster than a wake. 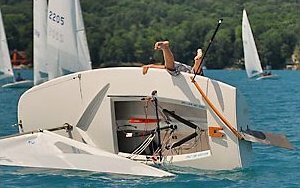 In the final analysis, a capsize is a result of unbalanced torques. 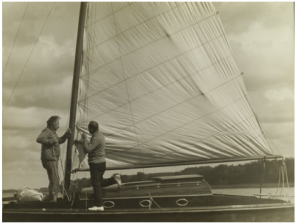 For small sailboats, the torque provided by the sailor’s position at the edge of the boat can provide the torque needed for stability. 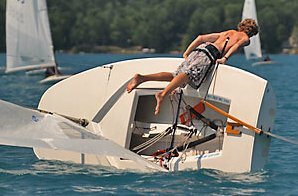 When a sailboat tips too far, the sailor’s torque is diminished as he is brought closer to the center of the boat. It takes a lot a practice to capsize as elegantly as this MC sailor. When the wind is astern, the required restoring torque is small. The sailor can rest in comfort. At this point, excessive heel means the sailor is contributing essentially no restoring torque. This sailor’s final position clinging to the bottom might help a little. But it is too late. Two comments have informed me that other picture of Albert and his boat was incorrectly placed at Saranac Lake in upstate New York. In fact, the boat shown is the Trummler, given to Einstein by wealthy German friends and later confiscated by the Nazis. I think the picture above is Einstein on Saranac Lake. Am I right this time? Just as one can duck behind a building to avoid the wind, sails reduce the wind speed in the downwind direction. If one sailboat is to windward of another sailboat, the downwind boat must sail in a reduced wind. The boat on the right in the figure will be sailing in reduced wind. 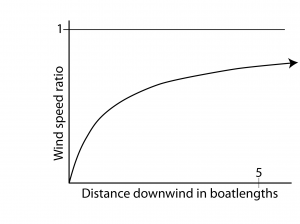 Theory predicts that the wind speed reduction should decrease as the two-thirds power of the distance downwind. The theoretical ratio of the wind speed in the shadow to the true wind speed is shown below. This theory predicts a wind shadow with a long tail. It also predicts the same reduction ratio for light winds and strong winds. Most sailors would not believe this theory. Traditional sailing lore says the wind shadow is more important in light winds, and the wind shadow becomes insignificant after about half a dozen boat lengths. Perhaps the difference between theory and reality lies in the turbulent nature of the wind. A swirling wind would more effectively eliminate the wind shadow. If the wind’s relative turbulence increases with the wind speed, this would explain why the shadows are more important in light winds. 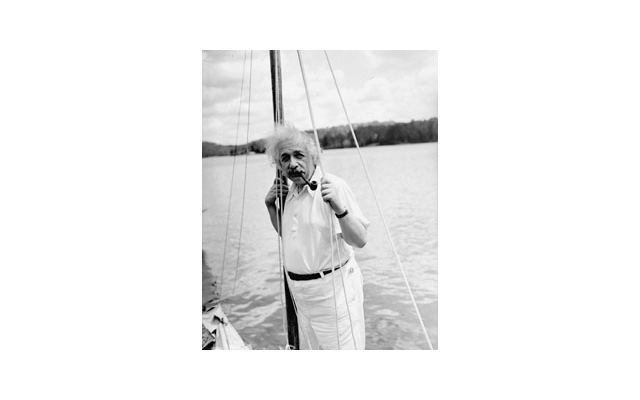 Einstein owned and sailed a number of boats. This one was on Saranac Lake in upstate New York. Air and water are the sailor’s fluids. (Alcohol doesn’t count.) Just two numbers determine the intrinsic properties of these fluids. PROPERTY #1: The density is a measure of a mass of a given volume of the fluid. Water has a density of 1000kilograms per cubic meter. Water is about 800 times as dense as air. PROPERTY #2: The kinematic viscity is a measure of fluid friction. Viscosity slows fluid motion. The larger the kinematic viscosity, the more quickly the motion stops. Air’s kinematic viscosity is about 15 times as large as that of water. Fill a hollow globe half way up with water and rotate it so the air and water inside are spinning. Stop the globe and the air’s friction will stop the air much faster than the water’s friction will stop the water. The magnitude of air’s friction is smaller, but its density is so small that it takes very little force to stop the spinning. In 1870 at the age of 46, Lord Kelvin (or William Thomson or Baron Kelvin of Largs) was delighted with his purchase of a 126 ton yacht, the Lalla Rookh. This boat was both a pleasure craft and a floating laboratory. 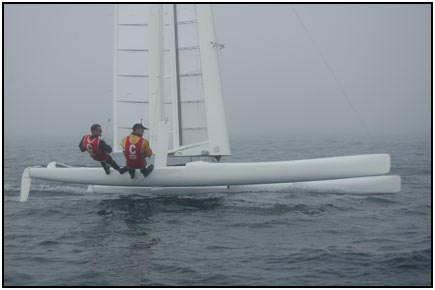 High tech sailing at its extreme is described in a very interesting article by Steve Killing which was presented at the Chesapeake Sailing Yacht Symposium, March 2009. The article is available at SteveKilling.com in the section on articles and books. Steve describes the design and construction of a winning C-class catamaran. Apparently the only rules for these boats are the requirements that they fit in a box that is 25 feet long and 14 feet wide, and that they have 300 feet of sail. Lack of any other rules allows carbon composite materials and a very light hull. The sail is a “wing” rather than ordinary cloth. The mast is very tall. Sailing these boast is challenging, but they are very fast. Although few of us will ever be able to sail or afford one ot these boats, they represent truly impressive technology. Can you sail in a vacuum? Zac completed a sailboat trip around the world on July 16, 2009. He was only 16 when he started the trip, and the youngest so far. You are currently browsing the Physics of Sailing blog archives.